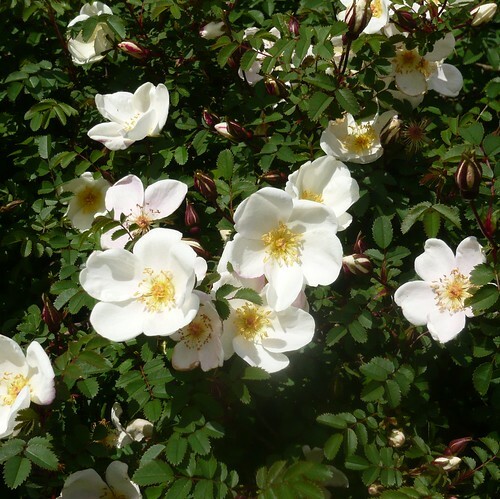 How to Prune Rambling Roses. Rambling roses tend to flower only once a year (not once a season as I once heard). Therefore it pays to optimise the flowering for next summer by judicious pruning and training. Prune from November to February, ramblers are pruned earlier than most other roses. Choose a still day or the branches will lash into you and the thorns can hurt. This is a job where protective clothing including a face mask may be worthwhile. Use sharp secateurs and a pruning saw for thick stems. Remove dead, dying or diseased wood and any stems that cut across one another. This improves air flow and reduces the chance of disease. With ramblers you are aiming to replace upto 3 older stems from the base and to encourage new growth that replaces them. Best blooms flower on this new growth. The newer olive-green stems should be supple enough to bend and they should be tied in or coiled around upright supports. This bending restricts sap flow and encourages more flowers so it is worth spending some time on. Ramblers are vigorous so reduce the laterals if you need too. Clean up all the debris after pruning.